January is National Oatmeal month, and I am taking full advantage because there is nothing that I love more on a cold winter morning than to fill my belly with a warm and nutritious breakfast. I'll be honest here- I am NOT a morning person, so I tend stick with quick and easy breakfast solutions most days. I've been known to rip open some of those instant oatmeal packets on occasion, but really, they aren't that tasty and aren't very filling. On the weekend I will put a little more effort into breakfast prep though, and that's where I totally LOVE diving into a scrumptious bowl of Outstanding Oatmeal from Golden Blossom Honey. Packed with oats, apples, raisins and walnuts, it is definitely not lacking in flavor. The flavor beats those instant packets any day of the week! It is so filling, I don't worry about getting to lunch with a rumbling tummy! Combine above ingredients and stir into hot oatmeal. Cover and warm over low heat 5 minutes until apples are soft. Meanwhile prepare topping. Toss walnuts with honey until coated. Spoon oatmeal into 4 bowls. Top with honey-coated nuts and yogurt. What are your favorite oatmeal mix-ins? I am not the biggest fan of oatmeal, but yours sounds pretty good. Chris eats oatmeal almost everyday, so he would totally love this. Not a fan of oats Dezzy! It's ok. I'll take your share too! I eat a lot of oatmeal. Your recipe looks like something I need to try. I love apples and walnuts. Oh snap! I must tell my oatmeal eating kid that it is national oatmeal month. No kidding, he eats it every single day for breakfast and sometimes snacks in between. He loves it! He eats a scoop of peanut butter (crunchy) and a handful of sunflower seeds mixed it. If we have nutella he wants a scoop of that too. My daughter does too! I swear, she has oatmeal running through her veins! With peanut butter is my favorite. I have never put sunflower seeds in there. Going to have to try that. Now I am craving a nice warm bowl of oats! WOW! 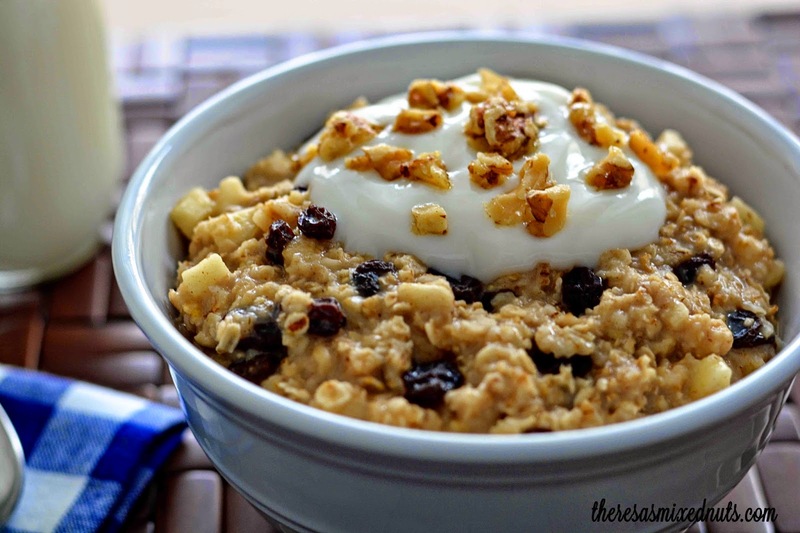 This oatmeal looks yummy, but I'm not a fan of raisins I would instead add cranberries! Thank you for posting! This looks so good! I make regular oatmeal often - I don't know why I can't think of some of these yummy things to add to it when I'm making it! I love cinnamon in my oatmeal. My son loves the maple-flavored oatmeal and eats it daily. That looks too good! It looks easy enough to make too. It's perfect for a busy morning. Those pictures are giving me goosebumps. This sounds really good. I am going to make Oatmeal for breakfast this weekend. My daughter loves oatmeal and is always trying new toppings on it. I don't eat oatmeal often but I could definitely go for some after seeing this recipe. Looks great! I ordered some oats from my grocery store Wednesday but I'm mad that they forgot them! I don't eat oatmeal but it looks amazing and it's getting me to rethink eating it again! I love oatmeal and have it often. I like the look of this recipe. My favorite option is maple syrup! Oh and butter, real butter! I love oatmeal - I pinned your post to my Breakfast board. The apple mixture & topping look delicious. Sounds yummy! Oatmeal and yogurt are one of my favorite combinations and you also added a lot of goodies as well. Oatmeal - yummy. Reminds me - - I suddenly want to have an oatmeal for tomorrow, haha! This made me so hungry that I went to the kitchen and made a big pot of oatmeal with apple juice, apples, raisins, dates and dried cherries! It was the best bowl of oatmeal that I have ever had! My kids are so pick about oatmeal, unless it is super sweet they will not eat it. I add honey and fruit in ours. I sometimes order oatmeal for lunch or dinner if we're out at a restaurant. I love oatmeal!! I am a huge fan of oatmeal. My favorite is McCanns steal cut. I especially love oatmeal with peanut butter. It's my favorite. This oatmeal sounds delicious! I've never put honey in my oatmeal before. I would say my go to is definitely brown sugar, I like it a little sweet. I didn't know it was National Oatmeal Month! This looks so yummy! My favorite oatmeal mix-ins are raisins with brown sugar. This combination looks delicious! That looks so good. May have to make that for my family. My boys love oatmeal. I'll have to try this recipe. I love oatmeal and I know how good it is for all of us. This is a great and delicious way to enjoy it. Mm, warm oatmeal with brown sugar makes for a very comforting breakfast. you make that look so good. i am not an oatmeal eater, but it is very good for you. National Oatmeal month? I had no idea. Guess it's time to eat more oatmeal!! That looks really good. I just purchased some oatmeal the other day. May have to try making this recipe. I love apples and cinnamon flavored oatmeal. It's delicious! I have this honey! I need to make this recipe. I love oatmeal with walnuts, honey and cinnamon! It looks like you're getting a lot of use out of that honey. That's great! My daughter would love this in the morning before school! Thanks for the recipe! OH I love a good oatmeal and yours looks amazing. Now I think I need some...right now LOL. I do like oatmeal and often have it for a snack. This looks yummy. Thanks. It was 73 degrees today. Too hot for oatmeal. I don't make oatmeal nearly enough. It is so versatile and so good on these cold mornings. This recipe so delicious! I eat oatmeal for breakfast almost every day and would like to mix it up a little. This looks good and would make a nice change from the way I usually eat it. Thank you so much for the recipe! We have decided to eat healthier and this sounds like the perfect breakfast! We eat lots of oatmeal. I want to try this out as it looks really really good! 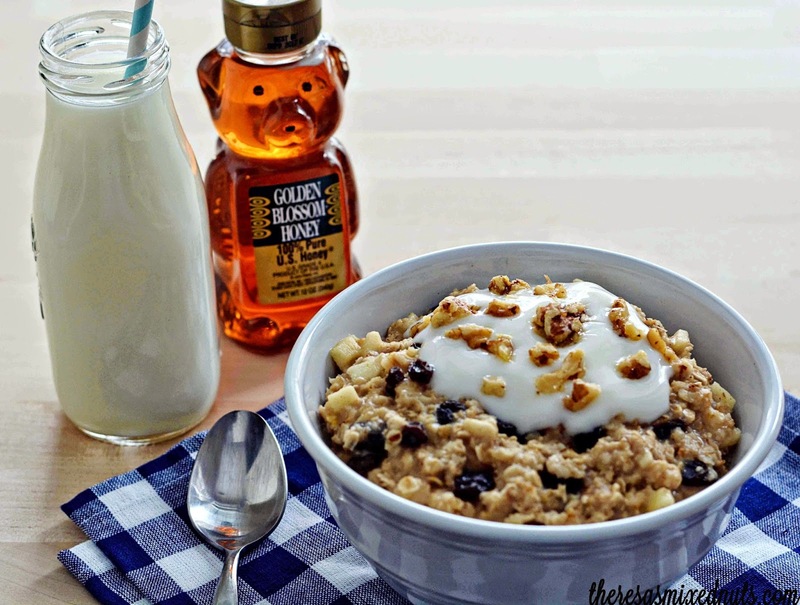 I love oatmeal, and have forgotten about it - this recipe has me remembering how good it can be, I'm making this soon! We love oatmeal. This looks delicious. I really like that it is made with apple juice, honey and a little brown sugar as sweetener. I've been making muesli at home for the longest time, I think my kids are getting tired of it. This recipe sounds like great alternative. Thanks for sharing!